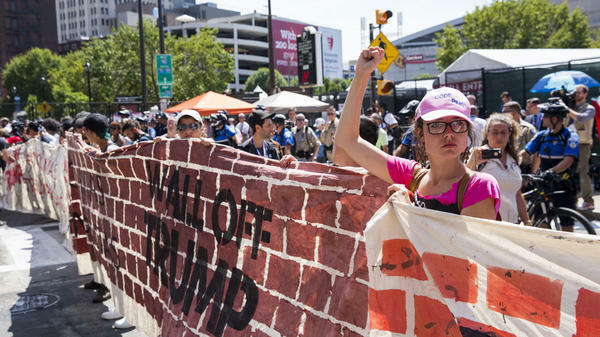 Immigration protesters opposed to Donald Trump's plan to build a new border wall protest in front of Quicken Loans Arena on the third day of the Republican National Convention, July 20, in Cleveland, Ohio. "I watched that and had this realization that this guy is serious about what he wants to do. I had an instinct to immediately call my parents," Park said, "I was pretty scared." Park isn't Mexican, but he is in the country illegally. So are his parents. They brought him to the U.S. from South Korea on a temporary visa when he was seven, just in time to start second grade in Queens, N.Y. When their plan for permanent residency fell through, they decided to overstay the visa. "This is just one part of myself," said Park, 20. But it has influenced him: He wants to go to medical school to treat people who can't access health care. "My dad, when I was in third or fourth grade, he had a really bad burn from the restaurant," Park recalled. "We dealt with that together at home. It's something I think about a lot." When he heard Trump's plans for illegal immigration, he saw how his own plans could unravel. "I'm going to fight to not be deported. If that literally means chaining myself to the gate here, I'm going to do that," Park said. "It's my home." Park is one of the estimated 11.4 million immigrants living in the U.S. without authorization, according to the most recent accounting from Department of Homeland Security (DHS). The discussion around their presence in the country has been particularly heated this election year. But while the rhetoric is loud, the actual people living with that status are largely invisible. About half of the people in the U.S. without legal documentation come from Mexico, according to the Pew Hispanic Center. The rest are from all over: El Salvador, Guatemala, Honduras, the Philippines, India, Korea and a mix of other countries, according to DHS. The estimate of 11 million has been relatively stable for nearly a decade, even though Trump has referenced the "record pace of immigration." Unauthorized immigration actually peaked in 2007. The downturn is largely due to a decline in people coming from Mexico. Between 2009 and 2014, more Mexicans left the United States than entered. A quarter of the unauthorized population lives in California and Texas but Florida, New York, and Illinois also have large numbers - about a half million each. Around half the people who have entered the country illegally or overstayed their visas are younger than 35. And one in three live below the poverty line, according to the Migration Policy Institute. There isn't a poll that specifically targets immigrants living in the country illegally and how they're feeling about the election. But there is data on immigrants in general. As the immigrant population has become larger and less white over the last few decades, they have also become more left-leaning. That means Trump's hard-line policies on immigration may be isolating a population that was already moving away from his party. Eight out of ten Hispanics have a negative opinion of Trump, according to a recent poll. And while not every Hispanic person is an immigrant and not every immigrant in the country illegally is Hispanic, that demographic does represent 76 percent of people in the U.S. illegally. Donald Trump has promised to triple the number of deportation officers at Immigration and Customs Enforcement and hire 5,000 more Border Patrol agents, an increase of about 25 percent. He also plans to end President Obama's executive actions addressing illegal immigration. He has repeatedly said immigrants in the U.S. illegally are dangerous and he has highlighted murders committed by people without documentation. At an August rally, he said "countless innocent American lives have been stolen because our politicians have failed in their duty to secure our borders." Of course some immigrants have committed crimes but as a group, immigrants are actually less likely to break the law. Regardless, the allegations of criminality can sting. "Donald Trump has given a platform to racism and xenophobia in this country," says Adrian Reyna, a 25-year-old advocate for immigration reform. Reyna and his family are in the U.S. without authorization. "For my younger sister, who is 14, she can't see the complexities," Reyna says. "Imagine being 14 and feeling really afraid of what people are saying at your school and in the public about immigrants and you know you're undocumented and your parents are undocumented and living with that fear every day." If elected, Trump says those here illegally will have one option: "To return home and apply for re-entry like everybody else under the rules of the new legal immigration system." For many, that means putting their name on a wait list with tens of thousands already ahead of them in line. Reyna came to the U.S. from Monterrey, Mexico in 2004 with his parents and two younger sisters. They crossed the border with tourist visas and settled in Houston. Reyna said he thinks it's important to keep pushing for reform, even if he doesn't know what will happen after Nov. 8. That's a lesson he said he learned from his parents. "I always ground myself in the memory of seeing my mom going into school and not knowing any English and just going at it," Reyna said. "To me that's the spirit I carry with me." If elected, Hillary Clinton has promised to introduce a pathway to citizenship for immigrants in the U.S. illegally. In a 2015 Gallup poll, 65 percent of Americans supported that pathway. Clinton has also said she will uphold President Obama's executive orders on immigration, only one of which is actually in effect. That order is Deferred Action for Childhood Arrivals, or DACA, which allows certain people brought to the country illegally as children to apply for protection against deportation for two-year periods. They can then work legally in the U.S. during that time. More than 1.2 million people have received DACA. The other order, Deferred Action for Parents of Americans (DAPA), would extend the deportation exemption to parents of U.S. citizens or permanent residents. The Pew Research Center estimates that 4.5 million U.S. born children have parents who are not in the country legally. A federal district court has blocked the order from taking effect. For Harvard student Jin Park, DACA made a huge difference. "President Obama changed my life," he said. "It changed what was possible for me legally and for my parents through me." He said the most important thing about Hillary Clinton is that she says she won't remove DACA. Reyna said he felt a sense of relief when he received DACA, but he said Obama's legacy is not without fault. "When we have deportation numbers in the numbers we have, it's very difficult to be in a position of saying the Obama administration has championed immigration," Reyna said. Obama has overseen more deportations than both George W. Bush and Bill Clinton. During his first term, the number of people deported increased each year, peaking at more than 400,000 in 2012. The number has since gone down. Clinton has addressed the issue of mass deportation. At the March 9 Democratic debate, she said she plans to pursue "comprehensive immigration reform, but at the same time, stop the raids, stop the round-ups, stop the deporting of people who are living here doing their lives, doing their jobs." "I remember the promises Obama made. They were very similar to what Clinton is introducing now," he said. "She has an opportunity here to come out boldly with a firm strategy to bring swift relief for our community." For Park, Clinton's plans aren't what matter most. "What I know of Hillary Clinton has been informed by what she's not, and by what Donald Trump is," he said. "We're here. We're not hypothetical. If you vote to deport undocumented people, they're physical people that you have to remove from the country. It's not a joke. It's people's lives."